Mr. Himanshu Moolchandani from IBM explained the insights of TGMC on 21.01.2016. This is a platform wherein you can show your talents and implement the concepts what you are learning in the curriculum. It is a largest software contest that initiates students in building capability that is the need of the hour in the industry today. The mission of this contest is challenging the students to solve real-life problems using morphing technical skills to capabilities. This year this contest is dedicated to building apps on the cloud using Blue Mix platform. 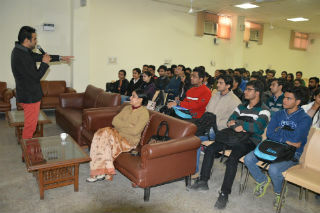 He discussed the need of development skills on cloud platform in the current industry scenarios. 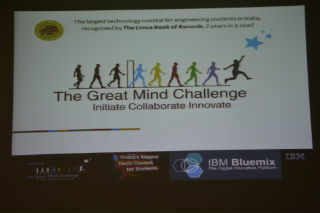 IBMBlue Mix helps you to focus on ideas and provides self-learning options by videos, demos, white papers etc.. He showed the web address for the registration process and motivated the students for the participation. Training will be provided by the IBM technical trainer if the numbers of registrations are more in the institute. He shared the Twitter handle, Facebook address and help desk number for further assistance.